Awesome recipe! As someone commented already I did substitute lemon extract for the almond and they were sensational. Next time I may experiment with maple extract. Recipe very close to my husbands grandmother from Sicily. All our family waits for these to be baked. Delicious cookies but a tip for everyone use crisco instead of butter!!!! SO MOIST AND PERFECT. Hello! Would it change the end result if the cookie adding a little bit more sugar? Made these for the first time yesterday. Followed your recipe exactly (used anise flavoring), and instructions. Best tip was to refrigerate dough balls before baking off. They came out perfectly, and are delicious. My girls and I made these together, and the group effort was appreciated in the frosting and decorating step. It made it go quickly and smoothly. These cookies will now be in the yearly line-up of Christmas cookies. Thanks so much for sharing! I have been looking for years for a milk-free recipe that duplicates my grandma’s anise cookies…and I believe I have finally found it! 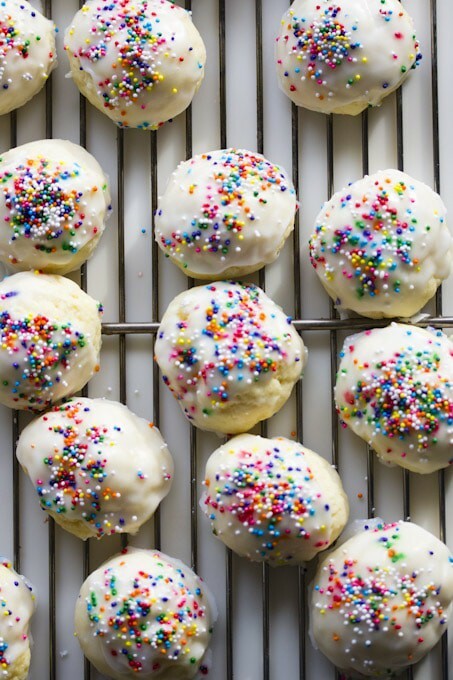 These cookies were simple to make, I followed your instructions exactly, and they are perfect. I used water instead of milk in the frosting, but they are still delicious. I wonder if you have any experience with shipping these cookies…I made the mistake of telling my niece what I was doing and now she wants me to ship her a batch! I shipped from Ohio to Denver. Packaged in cookie tin and bubble wrap. They arrived in perfect condition. Followed the recipe to the letter with no issues. I made these and the were so easy and delicious! Just one question….how can I store them for 3 days? I was excited to make these,then I realized I got interrupted and forgot to put in the sugar. Can you add sugar after it’s all mixed and chilled? I made these at Christmas as holiday gifts for neighbors and family. It was a major hit. They are delicious. I have made these cookies for several years at Christmas. Everyone loves this recipe, especially my Italian family! I’ve been looking to replicate an almond cookie. I’m looking to get a slightly dense and somewhat sweet cookie, but I’m not able to achieve it. I’ve tried a recipe with butter and a recipe with oil. And they both kind of turned out a little dry and fluffy slightly cake like on the inside. Which isn’t bad, but I’m trying to replicate another Italian cookie. I’ve also added a little milk to my recipe. And when I was done I added some flour to help me mold it. How does this cookie turn out? And any advice what I could do to achieve that cookie? I will have to try to chill it like u suggested next time. I made these but the dough was very sticky. Should the dough have been refrigerated it first. 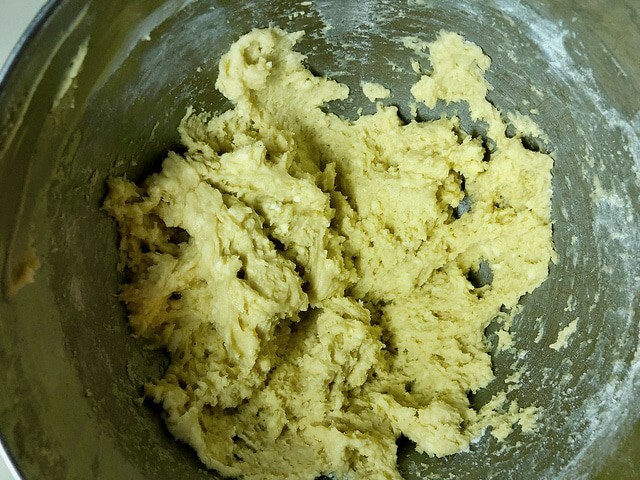 Hi Donna, the dough is slightly sticky, yes – I would say like chocolate chip cookie dough can be (the homemade kind, right after mixing)- you can use a bit of water on your hands when you roll the dough into balls if it helps or even refrigerate for a bit then roll them into balls. Then the formed cookies are supposed to sit in fridge for at least an hour after you form them. If you’ve ever made and rolled homemade meatballs, the dough reminds me of that kind of stickiness. If you are baking with a lower protein flour or maybe it is raining/humid outside, mayyyybe you need to add a bit more (1 or 2 tablespoons) flour, but I would try to form them without the extra flour if possible – I hope this helps? Hi, when you roll the dough into balls, do you tray them and put the whole tray in the fridge? Or do you roll them all at one time and stack them in a big bowl? We made these for years. We always refrigerated the dough before we rolled them. Never work the dough too much. The cookies will be hard. I bake these cookies & they will still be fresh? Mine are usually gone within a week so it’s hard to say. 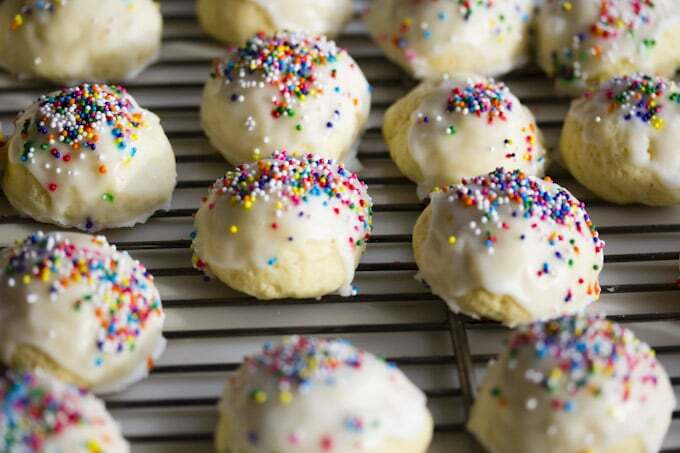 If you want to keep them for longer than 3 or 4 days, I’d say a safe bet is to freeze them (without the frosting) and then frost when ready to eat. The cookies should keep in an airtight container for at least a few days and maybe longer but I haven’t personally tested this so it’s hard to say. Why is it best not to melt the butter? 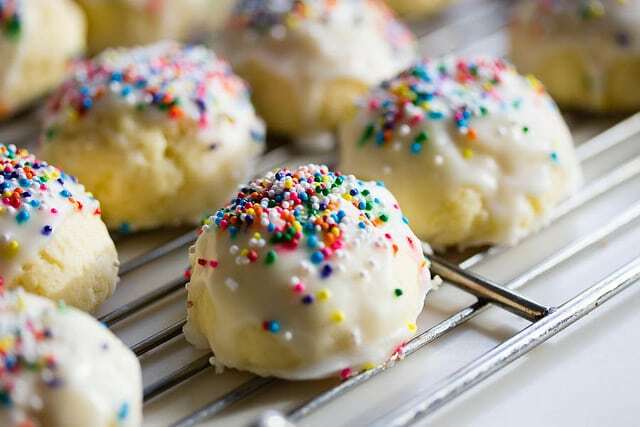 I made these with vanilla extract and they were perfect! Thank you for sharing the recipe. My grandmother had been making Italian Christmas cookie trays for Beyoncé she knew with these every year. I didn’t have the recipe tonight but thought I would give them a try. They’re perfect! Just like I remember! Wow that’s pretty cool- she bakes for Beyoncé! Why unsalted butter ? If salted is all I have handy can it still be used ? Made them with anise, tasted amazing!! I think a week might be pushing it but it might work – I’ve never tried that so hard to say, sorry. Great easy recipe! Tastes just like nonna’s. If I make the lemon extract which flavor should I make the icing? Lemon as well or vanilla? Just made the almond ones. Thanks. Ingredients call for 1/2 sugar…… cup? Tablespoon? So sorry! It’s 1/2 cup…fixed and thank you! What is the name for these…my husbands family calls them….spelling it how it’s said..”.todalooch” anyone know the proper spelling? Fantastic cookies. I have a question about the icing. I made a batch and shipped them to my mom seems the icing softened during shipment. I let the icing set for over a day. Any idea as to why this would happen? Should have put a piece of bread in to keep moister out. The old recipe that we used for weddings made a small hole in top then filled with different jelly then iced. They can be iced and frozen . Hi Mary – I’m not sure? I have not had that issue before. I’ve read that it can be caused by the outside of the cookie baking before the inside so maybe lower the temp of your oven by 25 degrees or so next time? Too much flour will cause cracking. Also sift flour. Batter will be sticky so dust hands with flour before shaping. I just made this recipe and I found that the wet ingredients never turned into a fluffy and light texture. I think its’ because the butter wasn’t melted. I noticed that many other recipes for this type of cookie uses melted butter or melted shortening. I’m wondering why this didn’t call for melted butter. Hmmm, I’m not sure? I’ve never had a problem whipping butter and sugar until fluffy and have never ever melted butter for cookies. from what I understand, melted butter results in chewy cookies and unmelted gives a more cake like cookie, which is what this is…it is possible you didn’t use room temp butter? that will affect that abiltiy to incorporate the ingredients. I used room temperature butter, then it all separated once mixed with the sugar and eggs. Then I tried softening up the butter even more (it was really soft) which resulted in a better mixture but still nowhere near fluffy. The butter still kind of separated slightly. Sorry to be a pain about this but I would really like to keep making this recipe, it ended up tasting delicious! I just want to make sure I’m getting it all right. Can this dough be used in a pastry bag to get uniform drop cookie sizes? Are they supposed to be sweet? We made these with a few modifications to accommodate dietary needs – Gluten free flour (1 for 1 substitution), Earth Balance buttery spread instead of butter, and coconut sugar (crystal, a 1 for 1 substitution) instead of regular white sugar. They held their shape well, crumbly but moist. But they weren’t very sweet, and I’m wondering if that’s how they’re supposed to be. 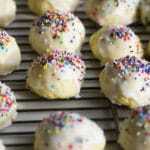 I’ve made other wedding cookies that are rolled in powdered sugar, usually twice, and they’re much sweeter. My friend’s niece has requested he make these for her wedding in a couple of weeks, and we made a sample batch to test. THOUGHTS? Edited to add that one of my favorite sites for vegan recipes has this gluten-free, vegan cookie recipe that looks good! Thank you for the feedback. I think we will go back to using the white sugar for the wedding, since she doesn’t have sensitivity to that, just gluten and dairy (oh, yeah, we used almond milk for the frosting). Just waiting on the bride’s feedback on the samples we sent her. We’re in North Carolina but the wedding is in Pittsburgh, PA. We’re making them, then traveling (500 mile drive) to the wedding city. I’m thinking we will make and freeze them 3 days before, , then defrost overnight the night before,, frost and sprinkle the morning of the wedding. Does this sound workable? Sorry to seem so meticulous about these, but I’ve not yet met this side of his family and I want to make a good impression. Your recipe is the one she sent, so I need to get it right! Thanks again! oh that’s awesome! yes, I would do what you are suggesting – freeze unfrosted and then frost afterwards. I have not testing this recipe with gluten-free flour or without the use of good old-fashioned butter, but would love to hear how those modifications work out for you. And don’t forget the frosting will add sweetness to the cookie too. This recipe just brought back many sweet memories.. Followed the recipe to the T, taste great. Very easy to make. I gave it 5 stars b/c I am rating the recipe and it taste delish not altering it and giving it 5 stars. *wink* The kids ate it all within 1 hour! Where is the ricotta cheese? I frost after the cookies have been baked and cooled. If the cookies are too warm, the frosting will almost completely drip off the cookie – thanks for asking – I’ve updated the post. These cookies are amazing!! Thank you for sharing the recipe!! I am baking these for an event for a desert table benefitting a local animal rescue I volunteer at. These cookies are that good!! Thanks again for the fantastic recipe!!! i’m so glad you like them – I love them too! how did it turn out Paula? I’ve made these before and measured incorrectly – could that be possible? what kind of flour were you using?